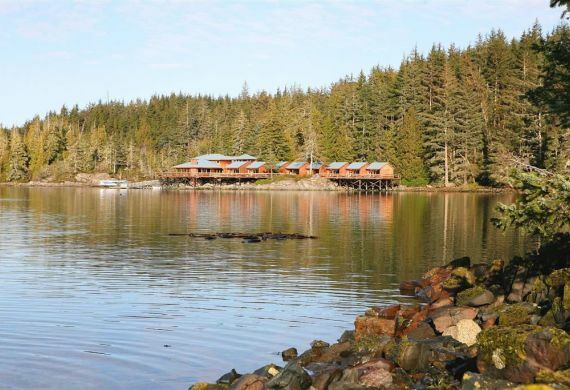 The lodge is located in Farewell Harbour on Berry Island on 10 acres of beautifully forested land. 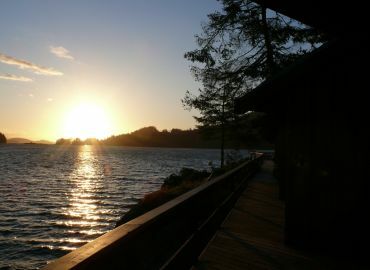 With the exception of the lodge property and 3 adjoining acreages, Berry Island is within the border of world renowned Broughton Archipelago Marine Park, which is located between Vancouver Island and the mainland of British Columbia with Queen Charlotte Strait to the west and Knight Inlet to the east. Farewell Harbour is a beautiful protected anchorage along the famed inside passage route to Alaska and we may see the twinkling anchor lights of a few yachts moored further out in the bay in the evenings. In fact, Farewell Harbour was named in 1870 by Commander Pender and officers of HMS Beaver, a Royal Navy surveying vessel. It was Commander Pender’s last survey stop and his crew had ‘fared well’ here before also bidding ‘Farewell’ to the BC coast for the long journey back around Cape Horn and back to England. 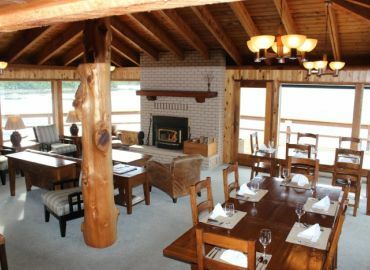 The primary lodge building and common area features a comfortable lounge and dining room, bar and a large brick fireplace surrounded by large windows and a wrap around deck boasting spectacular views of the harbour with its south and west exposure (great sunsets!). The expansive decks continue as a boardwalk along the shore, leading to eight, private ocean-side suites with ensuite bathrooms, a wood stove and 2 queen size beds. A ramp leads off the main lodge to our floating lodge below featuring four additional suites each with a private bathroom for twelve rooms in total. All lodge suites and common areas have unique design features incorporating natural cedar and local materials and art from the area that offer a distinctive, relaxing ‘west coast’ feel. Our floating accommodation consists of our original float lodge that was fully refurbished and towed from its original location in nearby Bones Bay (as the original Bones Bay Lodge) to its permanent home below Farewell Harbour Lodge. 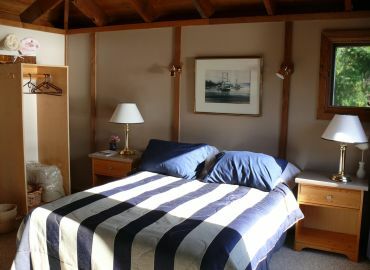 And we can assure all our repeat guests that the original Bones Bay Lodge has lost none of its intimate feel. We think you’ll find that the entire accommodation complex - both on land and floating - has a unique appeal and charm with its interconnected series of walkways that seamlessly blend the sea, the forest and our accommodation into a very special place.